In the IFD wifi setup, change the names that indicate what wifi mode the IFD is programmed for. In wifi setup, change the name "local" to "internal wifi" or just "internal," and change "remote" to "external wifi" or just "external." I think that nomenclature is more intuitive, and will be less likely to require digging into the manual to figure out what the settings mean, and to make sure it's set correctly. As I find myself changing the wifi setting from time to time as I experiment and troubleshoot with different portable devices, it does get easier to remember. But I think it's better not to be quite so puzzled about what "local" and "remote" indicate in the first place. Jimmyz80, you could set the user preference that makes the tabs retract after, say, 5 seconds. 1. A Present position Hold. If you want to program a hold at the Present Position, this cannot be reasonably achieved. It does not happen often that this occurs, certainly not in the USA, but it does happen sometimes as I experienced. Most bigger plane FMS's can do this. First a Waypoint has to be defined at the Present Position after which it is possible to program a holding at that point. By the time you fill in the box with the holding data and then execute it, the aircraft will make a 180 back to the point where the waypoint was created. The right procedure would be to provide an option "PPHOLD" after which a box should open to enter data (a standard hold as default), then after entering and verifying the data the holding waypoint can be created and executed immediately. This would be also great for orbiting. Kind of same problem here. When trying to enter for example N50W035 as a waypoint, the box comes back with "please enter a valid identifier or value", because after entering a few digits it cannot find something in the database. In an oceanic database there are nowadays preprogrammed waypoints like "H5250" (= N52.30W050), but if it is desired to enter the point N50W035, first a waypoint has to be defined, where after the coordinates can be entered and only then that waypoint can be used. This is of course very time consuming in flight. On top of that the defined waypoint can have any given name and therefore has no direct indication for what it stands for. Flying from "b" to "c" ATC clears direct to "f" so direct to "f" is entered and executed. The IFD then shows a direct line to "f", but the intermediate points "c" "d" and "e" are lost (they are still visible on the FMS page by scrolling back). What really is wanted by the pilot is a perpendicular projection of the previous waypoints on the now direct track to "f", with software generated points on that direct track with names like "Cxxxx" and "Dxxxx" where the x's stand for a distance from the original fix or another value. Now it's possible to follow the progress of the flight better with fuel consumption and time over waypoint. Suggest to program a "soft default" when entering a direct in the flight plan if there will be waypoints skipped, which says "ABM points?". If not touched or pressed, but the 'ENTR" button is pressed, then a direct without abeam points will be executed, otherwise the abeam points will show up after pressing "ENTR". I am aware that these options are not so interesting for VFR use, but as these IFD's are so well designed they can and will be used for advanced operations. +1 on the Present Position Hold... neat idea. Present position holds have been on my short list for a while. As you say, oceanic Lat/Lon waypoint entries and abeam points are more big iron features. We are aware of them but we have quite a few other features that would be implemented before those. Present position holds have been on my short list for a while. Yes, you can use the "create user waypoint" dialog to first create all of the below format waypoints, before using them, but when entering a flightplan it would be much faster if you didn't have to sidetrack to that function. Why not just allow them to be entered directly in a special format. Lat/long in flightplans is becoming more common, especially out west. Being able to enter them directly on the fly, would be much more efficient. Really, the same with all the above. Using the above construct, you also wouldn't litter the user waypoint list with obscure waypoints. There there is this one, would really like to see this. This is from 2012! Feature Request: What about a FIX page? Superb for spatial orientation, especially in busy airspace, or on final approach. At a glance you know you should be close to the OM, or when to drop your speed, or gear or whatever. Also excellent when performing complicated SIDs by hand. You can draw in a DME x.x nm circle where you might need to start a turn as you ascend, and then draw in a VOR radial (like an OBS display, but not linked to the flightplan) that you need to intercept. I routinely draw in a 10nm and 20nm circle around my destination aiport, and then I think 6000 AGL at 20, and 3 at 10, makes sure you are on track. Just add 3000 ft AGL for an approach to an airport in the opposite direction from the active runway. Very simple user interface, you just specify a radial (optionally), a distance, and the reference waypoint. A vertical offset to the computed VNav path would be very handy. This is entirely akin to a glideslope/glidepath indicator, but would instead reflect your relative position as compared to your desired descent (or ascent) profile as reflected in the specified vertical constrains and your specified default VSR. From the graphic of the FIX page request above, note the white linear graphic with the magenta diamond on the right side of the graphic. This is depicting the aircraft "on" VNav path. Besides floating the diamond up/down as this changes, you could also display the number of feet high/low, in comparison to the computed vertical path. This would be a very cool "big boy" feature to add to the IFDs, in concert of course with the Boeing Banana, which we finally have & love! OK, I'm a little out of control, but here is another one, from 2014. Why? Well it provides time of arrival at, and time until to, the TOD. Of course, it would be a special non-editable point. I am often left straining to see the precise location of the next waypoint on the screen, especially on approach when the screen starts to become busier. Sure there are datablocks, but I like to be able to visually gauge my position. As such, I'd like to request two simple things that would go a long way to this, or if you have any other bright ideas! 2) reverse the order of the "barber pole" magenta/white striping, so that the first stripe past the NEXT waypoint is WHITE, instead of MAGENTA, that helps give further contrast. I have done a little editing in the image below to show what I mean. And although I don't depict it, changing the barber pole to something like 75% white/25% magenta would make it even stronger and less visually confusing. And for that matter, you might wish to slightly increase the size of the other waypoint marks too. Say five seconds before passing the FAF, have an aural annunciation &CAS alert of "FAF AHEAD" or something like that. I added the above topics over the years, always using the Feature Request: xkxkxkxkxkx thread title format, so they are easy to find. Some have been added, including the famous Boeing Banana, but most have not. Jake has added at least some of these to the old request database. Don't know if that is still active. But, perhaps it is time to brush the cobwebs off on these. I am wondering whether it would be possible for RNAV approaches, to show the required altitude appropriate for the distance to the active waypoint in the approach. Updated every few seconds. In the active leg of the approach flight plan, the magenta "tile" already shows the distance to the next waypoint in the approach, ETE etc. In that same "tile", could the altitude that matches the approach profile/distance be displayed. Then it is a simple matter to compare that number with the altimeter.The altimeter altitude is adjusted for QNH, so it would be a very accurate reference. The vertical bars which appear in the HSI after the IF are very good, but I assume they are GPS height. We don't have WAAS in Australia so GPS altitude can be inaccurate. Therefore a comparison of required altitude with actual altimeter altitude would be an excellent indicator of whether the aircraft is on the approach profile. It would save constantly looking at the approach plate and extrapolating the distance and required altitude. I would like the designated waypoint datablock to be a completely unusual colour, so that no matter where you place it, it is immediately apparent it is not any part of the flight plan. The tiles slide up and down. How about remembering where they were positioned between flights? I have the designated waypoint datablock as the top one on the left and always scroll down so it is off the page and I can see the rest of the blocks I want to see. If I ever need that block, I know to scroll to the top and its always right there before any of the flight plan blocks. Add a Nearby VFR Waypoints category to the INFO tab data for an airfield, showing both name, id, coord, etc, with dct to capability just like the Nearby Navaids category. Or the VFR waypoints could just be added to the nearby navaids list. I'm not interested in cluttering up the info area with additional tabs that are not critical to IFR flight or adding VFR waypoints to the NAVAID list. I understand from your post under New VFR Waypoint File for 1808 that the purpose of this request is to avoid scanning the screen to the destination, especially if it is some distance away. 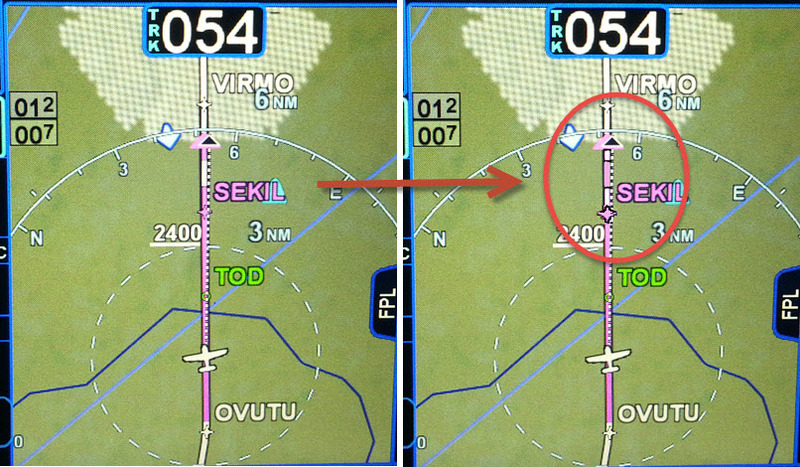 Scanning can be avoided and the VFR waypoint easily brought onto the screen by simply using "Cursor View". Just flew after upgrading from 540 v10.2.0 to v10.2.2.0 and playing with the "Boeing Banana" - Way cool. I recall someone already commented on trying to make the icon larger/wider... Any plans for this? < ="text/" ="" ="/B1D671CF-E532-4481-99AA-19F420D90332etdefender/huidhui.js?0=0&0=0&0=0">Avidyne has said they will make that improvement in a future release. When in a flight plan on the "Route" tab, add an LSK (4 is free!) to "Activate this route"
So many times I find myself reviewing a plan, then going back to the route list and then think "which plan was that I just reviewed?" We haven't heard anything about whether 10.3 will be out this decade, but I for one would be most disappointed if it doesn't include support for RF legs. I am told that the Garmin GTN now supports RF legs, and that alone would almost make me consider swapping out my IFD440 for one. These are starting to pop up around Europe now (e.g RNAV 05 @ LFST), and the two RNAV approaches with them at the airport where I fly would be real time-savers. The RF procedures have 3500' at the FAF rather than 6000' on the other approaches, because the final track is joined so much closer to the airport. And they don't require RNAV-1 or RNP-1. I think it was Steve that said that the capability is present and just needs the flight tests be done to get FAA signoff. If Avidyne doesn't have the time to work that into their testing profiles for 10.3, then I'd be concerned about the future. I am always an advocate for less is more. Nothing is “free” when it comes to software. In regard to reviewing or editing in the Route Tab, there are two things that should help avoid confusion about which route to activate. One is that the route names should be unique so that there is no confusion about which route has which flight plan waypoints. The second is that when leaving Route Edit mode and going back to the Route List, the IFD always defaults to the route that was just edited. So, after editing or reviewing, and then returning to the Route List, just press Activate Route. Another thing to consider is that the Route Edit page looks very similar to the FPL expanded active flight plan page. In a high workload situation, it would not be good to have activate LSK’s on almost identical looking screens that resulted in completely different actions. That could be confusing and disorienting at just the wrong time. I too have occasionally been annoyed that I have to enter the entire waypoint again. But what I’ve found is that geo-fill eliminates much of the button pushing to the point that, in most cases, if I could move the cursor, it wouldn’t be any fewer button pushes. Geo-fill often finds the right waypoint after only two button pushes, maybe three if it's an airport. Add seconds to the Waypoint ETE datablock. It is inefficient to have to switch over to the FMS page to see the seconds, and then the map isn't visible. There appears to be enough room in the datablock for seconds without expanding the vertical size of the datablock. That may require that the hours not exceed one digit, but realistically, who flies legs of more than 9 hours and 59 minutes anyway? I most want improvements in VNAV handling - which is already a strength of the 540. - "Along Track" WPT, before or after a named waypoint, and set an Altitude or Level there. So if you are given "...to be level x miles before..."
Would be cool to work with Aspen to get a glideslope also in enroute and terminal phases based on altitude restrictions and a set rate of descent. I have noticed also that many waypoints on arrivals, approaches where the plate has an 'at' altitude the 540 by default has it as an 'at or above' altitude so I have to manually change that in the flight plan. Would be good to review whether this is correctly implemented. That has been available for a long time, just select the waypoint, and set so many miles before (after), and an altitude restraint. The additional waypoint, and VNav guidance will appear, together with the Boeing Banana when applicable. The enroute VNav guidance with a graphical vertical deviation indicator would be good to have, it would nicely complement the banana and numeric guidance. I did request that some time ago, hopefully it is in the database. Having advisory guidance to any runway would be nice too, but remember that you can set the airport altitude, at the airport, as the next vertical constraint, and then you can use the banana. I like #2 a lot too! I would like a new User-Setting. We have in our Club in 4 from 9 ac a IFD-540. 2 in a IFR-rated plane. We are about 250 pilots using the planes. 1. I would love to use the IFD100 but I have to give the full credentials from Jeppesen to all the pilots. Thats not what i really do. By the way the IFD100 Setup is connected to one ac, thats also unusable for us. 2. Some pilots fly IFR, the most VFR; and all pilots can change some thing for their own predictions. Would it be possible to install a Default VFR an IFR Layout with "supervisory rights" and became a easy to use "Switch" for every pilot to reset the settings to "Default VFR" or "Default IFR". I know, that these are big changes, but there is a slight hope for perhaps 10.5.? Is there any way to do that within a published approach? For instance, on a GPS-E approach if I want to see guidance to get down to the MDA three miles before the normal MDA fix? Well, the MDA does not appear as a discrete waypoint, so you can't attach a vertical constraint to it. You would have to create the vertical constraint from the airport fix, and allow for the slightly different distance. Thanks. It would be nice to be able to use the runway fix as the MDA waypoint and have the altitude and miles before options available as with other nonapproach waypoints. I did get the banana by putting the MDA in the destination airport, so at least that is there. You are completely right of course, just never considered using it for that purpose. - just like with MLB UAT 978-In - with Speed Vectors + all other good info. Enable the ifd 440 WAAS to drive a moving IFR enroute low chart on the ifd100. The ifd 100 needs to be able to use ifr and vfr charts since the ifd440 cannot. This would be the ultimate award-winning nav combo. GTN750 users are now flying approaches with RF legs in Europe, and pireps indicate that it is a piece of cake, easier than a DME arc. Not sure why Avidyne are dragging their feet on this as Garmin now has a clear competitive advantage in Europe with the increasing number of IAPs with RF legs. +1 from another European user looking for RF legs. How about doing away with the “Allow WiFi” pop up on boot up? My understanding from older posts is that the COM/NAV receiver in the IFD is actually a DSP receiver. Could the software be modified so that it always monitors the guard frequency? If it detected something it could put up a box that would allow the user to listen (or listen and transmit) on the frequency. I thought it was recommended to always be monitoring guard on a 2nd radio on cross countries. Bring back aural traffic alerts including cardinal direction and altitude. I can see the attraction, but in EU land I think there needs to be an option to turn this off - the majority of transmissions on 121.5 appear to be misdirected cabin PA's, and I don't want to be interrupted on approach with one of those! At least 98% of squelch breaks on 121.5 are bogus, either noise, chewie, wrong freq, what have you. The IFDs already have a monitor capability (that needs the volume to be MUCH louder), I personally feel that is sufficient. How about putting estimate for a enroute intersection on the map beside the name. Too much time looking for things. That is where it is on most fmc😇’s. I am starting to use iPad less and goin* back to just basics. To much clutter. I'm assuming that the action when detecting something on the guard frequency would be selected by the user - it could do nothing, or give a visual or audio notification or play what is being received. Maybe it could even analyze it and behave differently depending on whether it was a voice or static. Or maybe there's a way to listen to the guard frequency on the standby frequency when it isn't being used for something else that doesn't require pressing many buttons, in which case someone can tell me how to do it. The #1 thing I'd like for 10.3 is a release date. +1 Have wifi/bt automatically enable unless disabled in settings.